For our second DSLR Photography Lesson, Sarina and I once again split the lesson time between (first) shooting and then editing. She had the chance to photograph a dancer (see photo above) since we last met so for the shooting portion of the lesson I gave her feedback and demonstrated more ideal settings she could have used for those shots. Then in the editing digital photos half of the lesson I really emphasized how cropping can make a tremendous difference on the overall impact of a photograph. Plus, cropping is the easiest edit to do on a digital photograph. 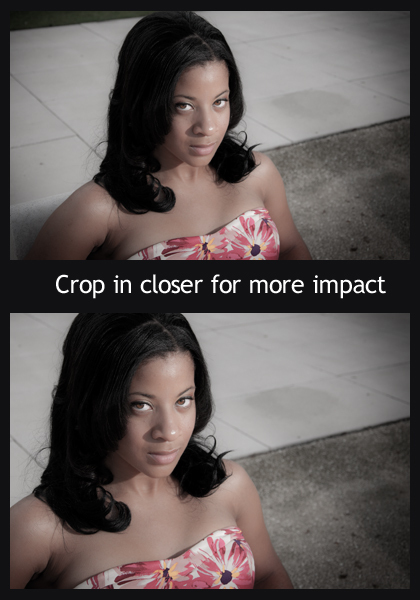 Therefore, a photography tip for you is to start your editing process by cropping. That is what I do. Many times I do frame the shot in the field exactly how I want, but sometimes once viewing the image on my 24" monitor at home I see the potential for an even better composition. Or, I decide I want the focus of the image to be on something other than what I originally intended. There seems to be hesitation in new photographers to crop off the top of someone's head. Do not be afraid, it will not hurt them and it will often help your image! If you are an experienced photographer now, go back and look at your early work. I bet you will see a progression of always trying to include the entire body or upper half of a person in a portrait to not being afraid to make radical crops that remove large sections of the subject's head. Cropping in closer creates a stronger connection between viewer and photograph. In the above example which one of the two feels more personal? For me, it is the tightly cropped image.